Sharon Cuneta is all smiles and on her way to Bacolod this afternoon despite having lipoma surgery yesterday, May 30. 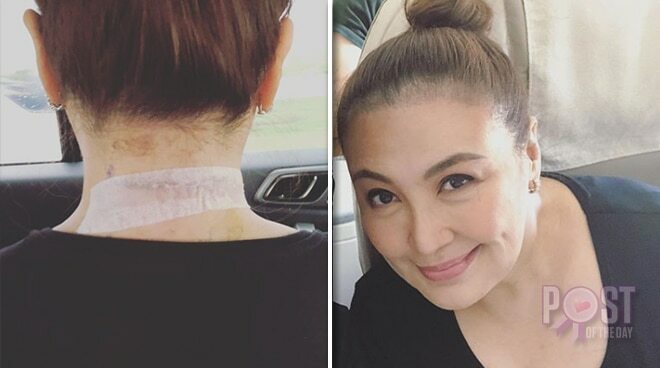 In an Instagram post, the actress shared a photo of her bandaged nape and admitted it was still painful. However, she has decided to push through with her concert in Negros Occidental with other OPM greats, Martin Nievera and Basil Valdez. "Masakit ka pa rin pero basta magko-concert ako!" she said in her photo's caption. Surgery schmurgery! Masakit ka pa rin pero basta magko-concert ako! Hmmp!!! Hahaha! Thank You Jesus. On out way to you now, BACOLOD!!! Now on board our PAL flight. Martin, Basil and I are so excited to sing for you tomorrow!!! God bless us all and see you!!! Yippee!!! Praise God!! !